If you are looking to start up a business from scratch, or even if you are an owner of an established business, chances are you have some sort of passing knowledge of the American Disabilities Act of 1990. While the basic tenants and principles of the act are something that you may be familiar with, some of the more intimate details of the mandate may not be so easy to recall. One of these details are rules built around the creation and presence of ADA signs. 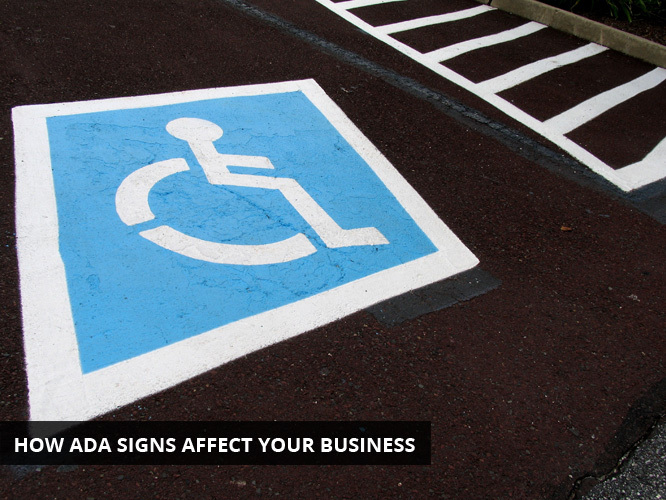 In essence, ADA signs are business signage that allows disabled Americans to experience the same ability to use and navigate various facilities within commercial business structures as non-disabled persons would be able to have. ADA signs solely consist of “architectural” signs that are permanently affixed to the buildings and carry out navigational functionality, such as signs directing people toward exits or restrooms. Signs that are designed for promotional or advertising purposes, or signs that are designed for temporary usage, do not comply with this mandate. Company logos are also exempt from ADA signage regulations. Some of these ADA compliant signs are expressed with words or phrases. However, there are some that are expressed with symbols. The most prominent one is the International Symbol of Access, which is more commonly known as the “wheelchair symbol.” Other symbols include the “ear” symbol that represents the International Symbol of Access for Hearing Loss, the “keyboard” symbol which stands for a text telephone (or a TTY), and the “phone” symbol with sounds waves that represents the availability and accessibility to a volume controlled telephone. The first rule of thumb regarding proper ADA signage is that each ADA compliant sign must contain Braille in order for the blind to be able to read them. Yet that basic and fairly well-known tenant only scratches the surface in terms of ADA signage requirements. For example, in order for an ADA sign to be considered compliant with the Americans with Disability Act of 1990, it must have a specific amount of contrast in the colors that are used on them. The law also contains very strict guidelines concerning the fonts that are used on the signs. For instance, these signs must feature letters in all uppercase letters and must be represented in sans serif fonts. Additionally, all ADA signs must contain backgrounds and characters that do not emit a glare. These rules are in place in order to not only make them easily readable, but also to be clearly visible. A business that does not comply with the mandate regarding ADA signage could result in the company facing a stiff fine or even more severe legal action. However, any negatively impactful actions such as fines or litigation would not be immediately placed on a business. The law does state that a business that is not in compliance with the ADA’s signage requirements can rectify this oversight in a timeline that does not cause what is deemed to be “unnecessary hardship” on the business itself. This part of the law could be especially noteworthy to new businesses that may have launched, but have not quite gotten around to setting their office up with the required signage. This gives them enough “wiggle room” in order to become compliant in a suitable manner. If you find yourself in need of signage that complies with the mandates of the Americans with Disabilities Act of 1990, the good news is that acquiring the signs that you need in order to match this compliance is not all that difficult of a process to undertake. The Internet alone provides a wealth of places that you can drop in on and purchases whatever signage that you may need in order to be on the right side of the ADA, all at competitive prices. Ultimately, it is important that you do take the time and purchase these signs for your business, regardless of where they are purchased from. Even though the law does give you leeway to get signs up if you are not compliant, you should bear in mind that this measure of leniency is not designed to be one of a permanent nature. And when all is said and done, this makes a lot of sense. After all, being compliant with the Americans with Disabilities Act of 1990 is the law, and that cannot be broken, even if it can be temporarily bent.